Time to talk about day 2 of Gamification Europe! Day 2 was also stuffed with loads of great talks, panels and a fantastic workshop. So let’s start! 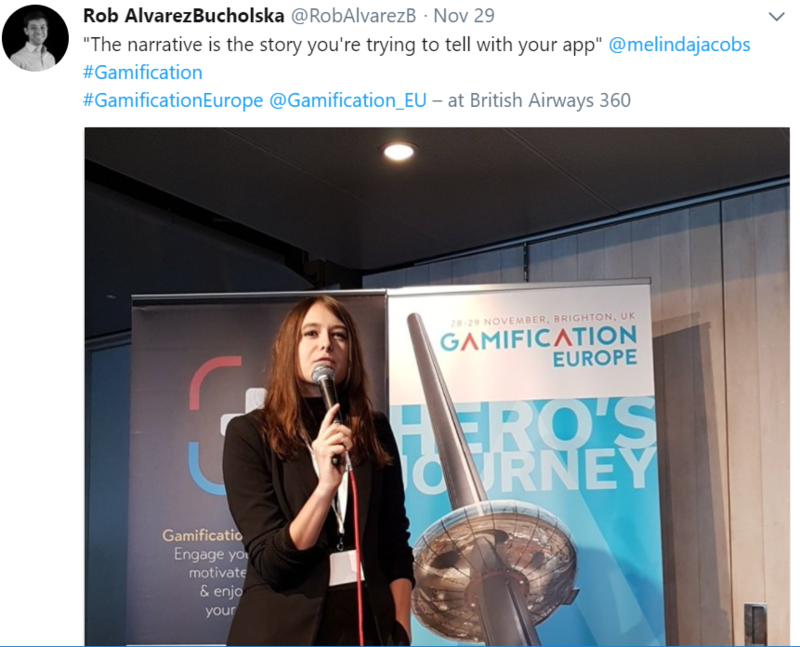 Melinda Jacobs joined us on day 2 to share her experience and insight on how our gamification needs to have some narrative and how all products and companies already have a narrative even if we don’t realise it. Gamification is about the environment you communicate your narrative in. I feel that was maybe the best takeaway. We are telling our users that they need to use us to do something, learn something etc so how is gamification helping that story? Marigo took the stage after Melinda and talked to us about the big picture in gamification. She shared a lot of great insights from her PhD research. For example, how a small change that you make in a big system will have multiple effects and you never know how your gamification design will affect the system. As a warm up exercise she had every table to create the biggest balloon structure possible. Gave us enough time to solve the monitor problem as the monitor suddenly decided to not work as she was starting her presentation! She also raised some very important questions about how we affect the world around us with our gamification designs and what is our impact on everyday life problems. A lot of emotion from Marigo and everyone in the room during this part of her talk as we all want to make a positive impact on the world around us. I have to admit that Marigo’s and Karen’s talks were my favourite from these two days. I love seeing the big picture in everything I am involved with and these two talks did just that. Karen talked about how gamification is not a methodology that suddenly popped up out of nowhere and will definitely solve all the world’s problems. 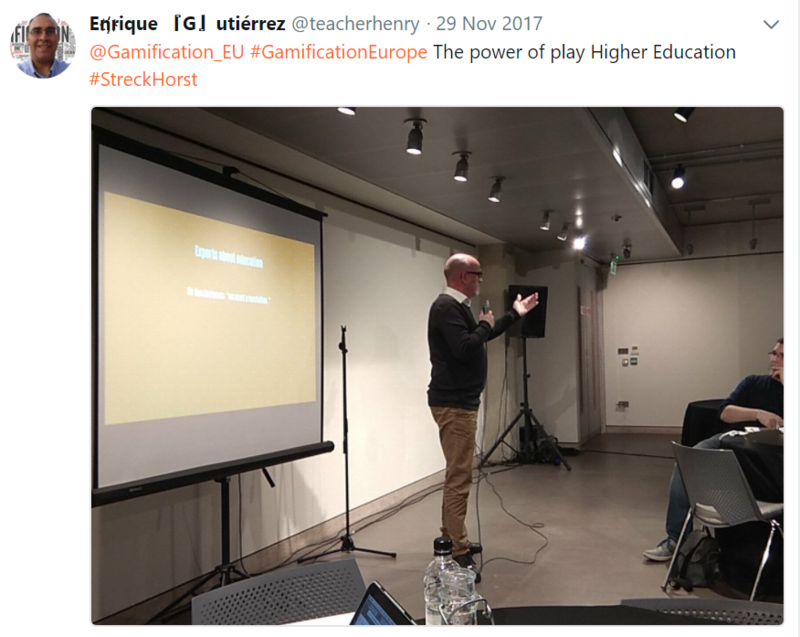 There are a lot of other theories and academic research and methodologies that support gamification and in some cases, like UX design, gamification is part of. 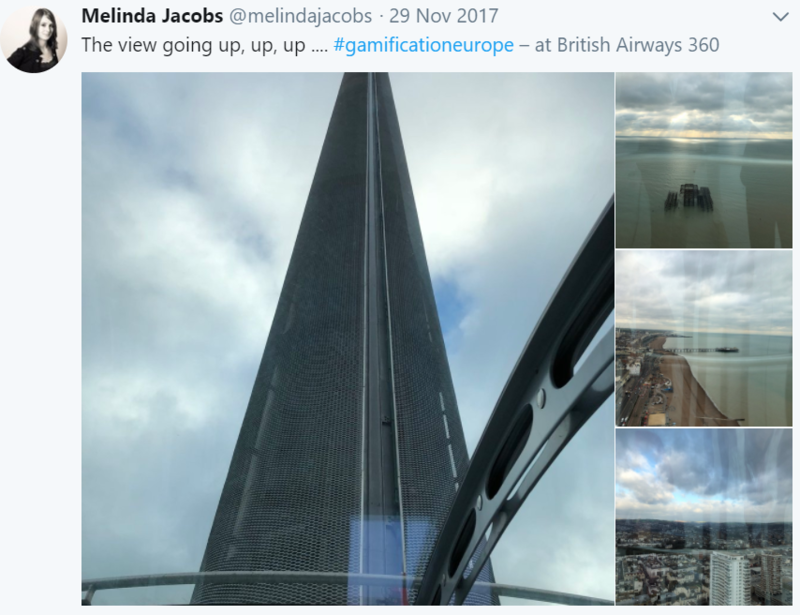 Gamification should not be an end to itself like she says and we should be looking at case studies and results instead of the mythology around gamification and it’s great results in general. 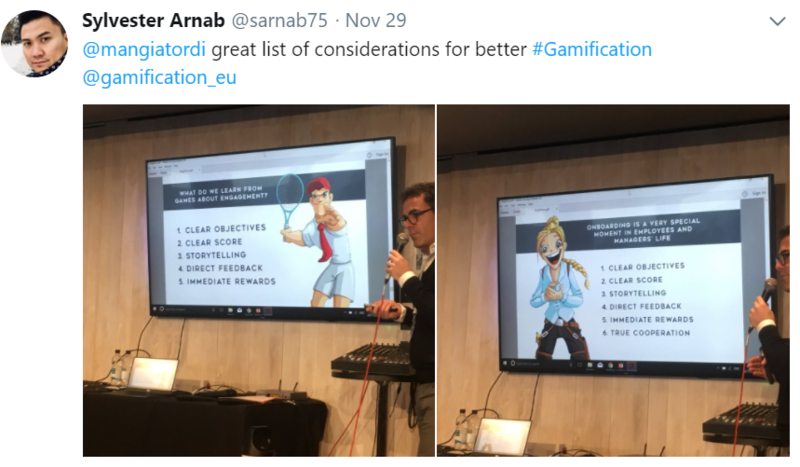 Altug Yilmaz, the GamFed Turkish ambassador was next and did a great job on summarising a lot of the theories and frameworks that support gamification. It’s really nice when someone comes along and shows you things you didn’t know about even if you work in the same industry! I liked the point that Altug made about Halo selling more copies than Crysis just because Halo has a more interesting story. Fitted Melinda's talk and Jeff's Gomez talk really well to show us how important story is. Dominique is one of the people working with gamification even before it was called gamification. He shared with us his experiences from designing Happyformance an application that gamifies project management. Project management is really hard to gamify and I was really curious to hear about what they are doing. I believe that the different social game mechanics that they deployed brilliantly in their system is what really makes it interesting. Dominique also gave us a great list of suggestions to design better gamification. We all know what a great speaker Andrzej is so everyone was excited for his talk and lessons from the front line. He did not let us down of course as the three stories that he shared from his experience in gamification were fantastic. All failed projects for different reasons and great insights and advice. The following Tweets demonstrate the main points of his talk perfectly. Solutioneering was the most popular I think by far and something we see a lot in gamification. He also talked about how players that really want to get a reward will try and use the system to their advantage as much as they can. I liked his final advice as it applies to every profession and industry not just gamification. When you are wrong all you have to do is admit it and try to learn from your mistakes. We were very lucky to get a free flight during the second day’s lunch break. The view was amazing and there was a lot of great networking, selfies and fun going around. 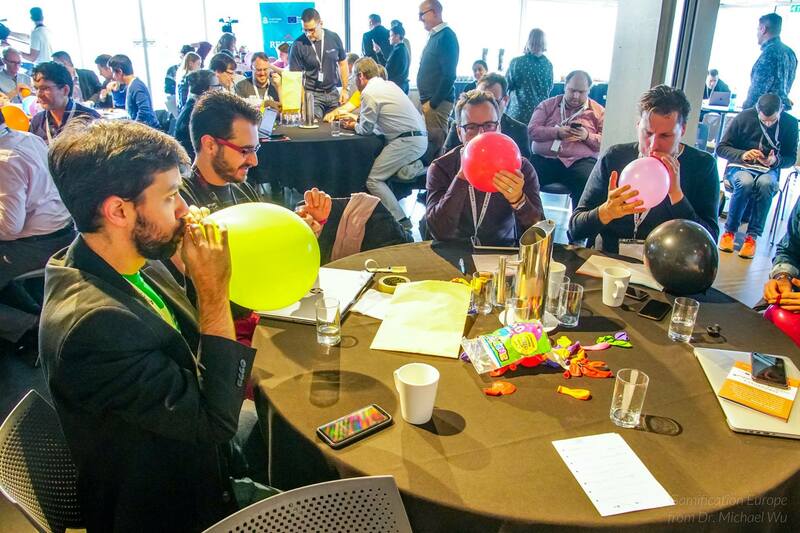 I think that was one of the highlights of the conference as it is something you don’t often do at conferences! Everyone was waiting for this workshop! Michael Wu is one of the people in the gamification industry that brings in academic rigour and deep knowledge in things like point systems, data and computer science. Michael started by talking about how we need to find a problem we want to solve with gamification. He has us working in teams and come up with behaviours that need to be motivated from the system and adopted by the users. Then we went deeper and talked about point systems! At the end he highlighted the importance of well-designed missions to nudge the players along the whole experience and give them feedback on how well they are doing. Again, not being there for this talk as I was attending Michael Wu’s workshop, I will use other people’s views on her talk and the video we got! Sabrina talked about how we all got preconceptions on what men and women want out of a game and a gamification design. No matter how many times I think about the whole gender-targeted design that we still see in toys for kids band games, I am always surprised how people can’t understand what the problem is. After dispelling these stereotypes Sabrina gave some ideas on how to fix things and design for everyone using the Octalysis framework. We thought that Sabrina’s talk was very important for the industry so we decide to organise a panel on women in gamification to follow that. For any industry to survive and be creative it needs to provide everyone with the same opportunities and listen to their ideas and try them out. The panel was Marigo Raftopoulos, An Coppens, Melinda Jacobs and Sabrina Bruehwiler. Some of the issues discussed were around how an idea presented by a man seems more credible to a male audience even if it was a woman that came up with it. 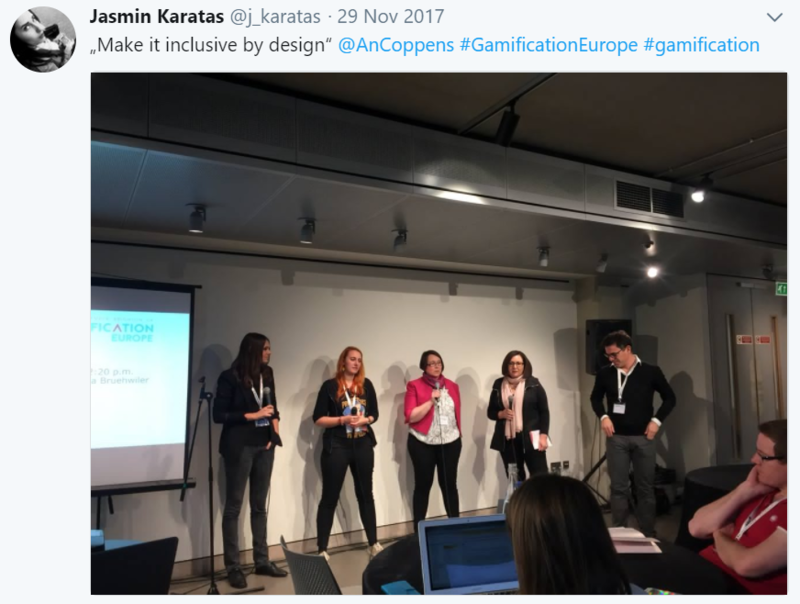 What does it feel like being a woman and working in the gamification industry and finally what do we need to do to have more women working and feeling part of the industry. Our other idea for a panel was to put people that have worked in different countries and with different cultures and talk about the differences that has on the gamification design of their solutions. The panel was Pete Jenkins, Sylvester Arnab, Jasmin Karatas and Ahmed Hossam. All people from different cultural background that have different experiences in the gamification industry. Of course the answer to the question is that there are cultural differences that affect gamification design and we should be aware of them. Competition was one example that stuck with me. Ahmed talked about how in Arabic countries people try to avoid competition because it is not considered polite to be openly competitive whereas in Asia its more than common, people love it. Some great insights from this one. Will Stuart Jones talked to us about two game mechanics that are paramount to many games. Chance and choice. He presented 3 case studies from his own experience with 3radical and the gamified marketing campaigns they have designed. All of these case studies had some element of chance and choice and were quite effective in engaging customers. Roberto was the next speaker and shared a very interesting failure with us. When he started working at the IE Business School he designed a gamification project for his students that did not work. What he did was make iterations and test it again and learn from his mistakes. Very interesting to hear someone openly share about his failures. Check his gamification podcast here. Last speaker of this track was Jasmin Karatas. She works for Accenture Interactive so she had a lot to say about working in big teams with other big companies and consulting and design projects that take months to put together and complete. Her advice on marketing yourself as the person to go to for something in an organisation and especially a big one like Accenture makes a lot of sense in an industry as well. Be true to yourself and prove to others you can do it and things will happen. Track 2 was the education track. It started with Adam Pusztai that talked about zero cost gamification and how to design that. Of course Adam needed a tool to help him design his project and he used Octalysis for that. He also shared great insights on how to build gamification with a small budget. Very interesting talk from someone that you can see really believe in what he does and works towards improving his profession. Bernardo shared an extensive list of what NOT to do in a classroom if you want to gamify it. He has been working in gamification and education for a long time now. He shared his story and how he got into gamification and how he failed and learned from these failures and created this NOT do list. One of the most important advices he gave the audience in my opinion is that players need to learn to embrace failure so you need to make them fail and show them that failing is fine. When you die in Super Mario nothing happens, you just try again from the start till you figure it out. Horst is a very experience game designer that decided to focus on gamification of education. He has been running a very innovative course based on gamification and shared his views on what education should be to serve the students better. A really important take away from his talk in my opinion is the fact that the age of control is over. We need to give students as well as employees autonomy over their learning and the way they learn. Teachers are preparing their students for jobs that have not been invented yet so how do you prepare them for that? So that was the end of track 2 of day 2! That was also a lot of fun! We went to a very nice games cafe on the Brighton seaside and had some drinks, food and played games! Some went for digital some went for board games. There were a lot of interesting conversations around the future of the industry and of course games! It's always nice to have some fun after such a stressful two days and I think we all needed and enjoyed ourselves. 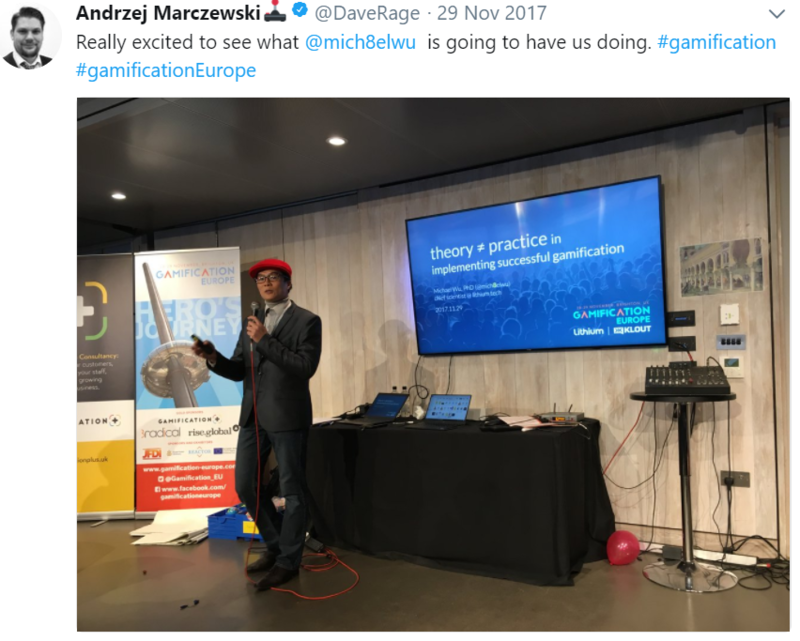 Gamification Europe has been a great learning experience, both organising and attending it. I am really looking forward to organising the 2018 edition! 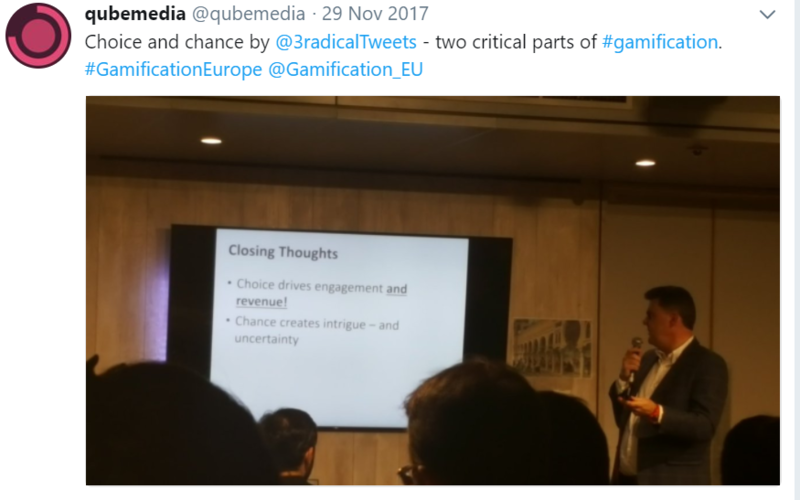 Check Out Gamification Europe 2018! 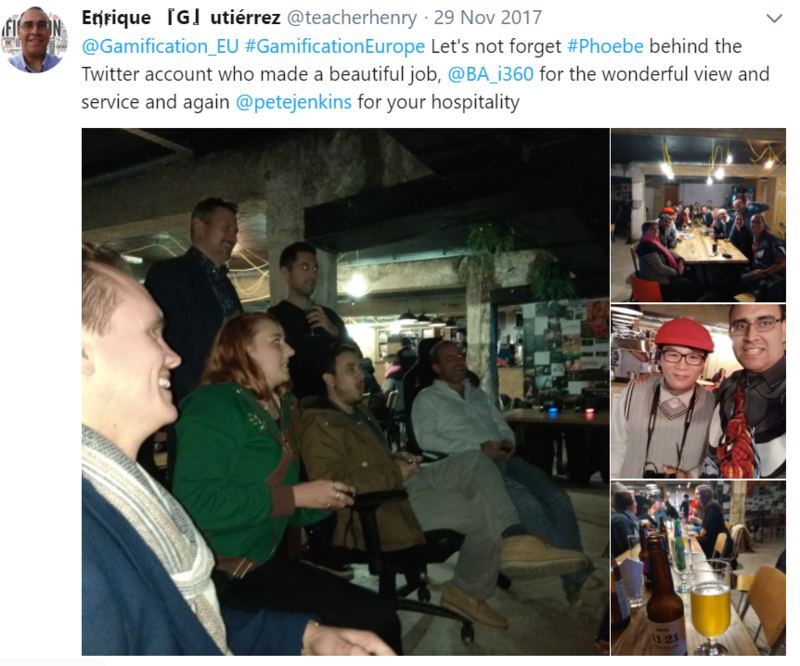 I will end this blog post with some advice for people that would like to try something similar to Gamification Europe. These are the things I learned from organising this event. First insight that I have to give to anyone organising a conference is, try to make sure what they talk about matches the theme of the event. After that, let them do their thing while providing anything they may need to deliver their sessions. Everyone was super professional in their talks, they had great content, answered questions and participated with great joy in the other talks and workshops. Trust your speakers! They are the heart and soul of every conference. Second tip is, no matter under how much pressure you are under to put everything together, if something feels wrong and you have an alternative, trust your instinct. Initially the plan was to have the conference at the Hilton Brighton Metropole. When I went to see the room we would use, I just texted Pete “to be honest I don’t think this is the right venue for what we are trying to do, are there any alternatives” and that is how we ended up at the i360 which was the best decision ever! It was the perfect size for the number of people that we were expecting, the view and surroundings were fantastic (Brighton can be truly beautiful and we had excellent weather both days) and they even gave us a ride on the i360!